The kids rocked out to Michael Jackson's "Thriller"
Kanye West's son Saint West and Chance the Rapper's daughter Kensli had a dance party on Sunday and rocked out to some Michael Jackson together. Chance shared a video on Instagram of the kiddos showing off their moves and captioned it "Reunited and it feels so good." In the video, Kensli and Saint jump around to "Thriller" and Chance can be heard in the background repeating, "Get it, get it!" Also on Sunday, Kanye and his 2-year-old threw the ceremonial first pitch at the Chicago Cubs-Chicago White Sox baseball game. They each got a chance to toss the baseball towards home plate. When the rapper walked out onto the baseball diamond, his hit song "Homecoming" blared over the speakers. 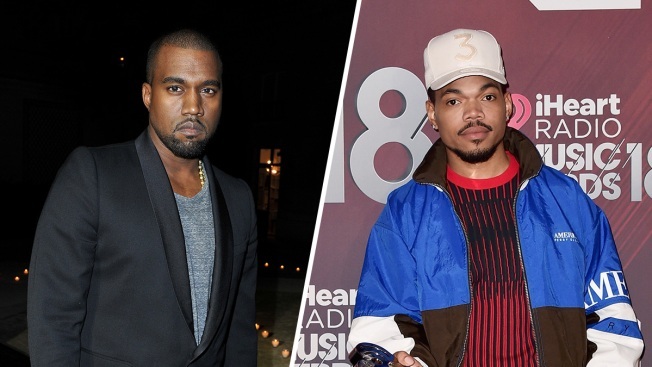 Both Chance and Kanye proudly hail from the Windy City, and 'Ye recently said he's looking to make that move a little more permanent. On Tuesday, The Life of Pablo rapper told a crowd in his hometown, "I gotta let y'all know that I'm moving back to Chicago and I'm never leaving again." After all, the city is the namesake for his and Kim Kardashian's third child, Chicago West. In July, Chance proposed to his longtime girlfriend Kirsten Corley during a Fourth of July celebration. She said yes. On her birthday in May, the "No Problem" rapper wrote about how much he loved her in an Instagram post. He said, "From the beginning beginning to the end end. You are my oldest and best friend. You are responsible for every one of the most wonderful things in my life." In Jan. 2017, Chance graced the cover of GQ and discussed his own perspective on Kanye. The two have recorded music together ("Ultralight Beam" on Life of Pablo) and the 25-year-old is considered by many to be Kanye's protegé. He even says on that song, "I met Kanye West I'm never going to fail." "I don't think I ever wanted to be like Kanye in personality," he told the magazine. "I've always been able to defend Kanye. When everybody's like, 'Kanye's a nut, Kanye's a nut,' I'm one of those guys saying, 'No, he's saying some real s--t.'"
In August, Kanye and Chance were seen together in a recording studio in Chicago where the two of them are working on a joint album.